A nearly 90-year-old advertisement that propelled Ford Motor Company’s vision for putting the world on wheels and recently helped transform the company from survival to profitable growth has a fresh face. The “Opening the Highways to All Mankind” advertisement originally was placed in the Saturday Evening Post on Jan. 24, 1925. 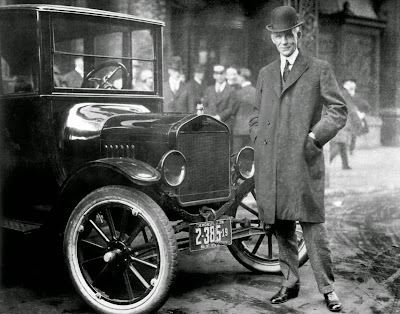 It detailed Henry Ford’s original vision of providing affordable, safe transportation to everyone. In 2007, the ad came to the attention of Ford CEO and President Alan Mulally and other senior leaders. After years of declining sales and profits and in the face of a looming financial crisis, the company once again used the ad as a vision for its transformation from survival to profitable growth. The ad came to signify a compelling vision for the company and its employees as they implemented the One Ford plan, which involves aggressively restructuring, accelerating the development of new products, strengthening the balance sheet and leveraging global assets. Mar 1, 2013 | Dearborn, Mich.
1901: Henry Ford Company organized with Ford as engineer. Ford resigns over dispute with bankers in 1902 and the company becomes the Cadillac Motor Car Co.
1910: Begins operations at factory in Highland Park, Mich.